f you told me a couple of months ago that the Gunners were going to play a match without Alexis Sanchez I would have chewed off all the nails in my fingers in fear, and probably go on to chew another person’s fingers too. Alexis Sanchez is more or less Arsenal and according to the stats boys, Sanchez is top for goals (12), assists (7), chances created (57), shots (45) & dribbles (143). So we learn that he has a hamstring strain and Arsene Wenger has confirmed that he’s unlikely to risk his Chilean maverick. But guess what? Santi Cazorla is in the form of his life, Olivier Giroud has been chipping in the goals on a regular basis, Theo Walcott and Mesut Ozil made goalscoring returns from their injury layoff, Tomas Rosicky still has that fire in his belly despite his age and of course, Aaron Ramsey is still trying to get a hang of things. So yeah, Alexis deserves to get some rest. After a two-week break, the Premier League returned to our screens with Hull struggling again against a Newcastle side that had not secured a win since Alan Pardew left for Crystal Palace. Comedy errors gifted the Magpies all three points but unfortunately the final scoreline wasn’t a true reflection of how things panned out but hey, that’s football. Then there the 4.00pm fixtures that saw Tottenham continue their good form with Harry Kane on the score sheet again and Manchester United eased past Leicester, which makes today’s fixture an all-important clash. The final match of the day between Chelsea and Manchester City was meant to be a tasty clash but it turned out to be a boring fest. To team news, I expect David Ooooooooooooooooospina to replace Wojciech Szczesny in goal, unless he has picked the kind of peculiar injury a goalie picks up when he has taken Szczesny’s place. Calum Chambers did okay against Brighton but you’d Hector Bellerin to get the nod ahead of the Englishman while it would be interesting to see who features on the left with Kieran Gibbs coming back to full fitness and Nacho Monreal in a good time patch of form. The central defensive pairing picks itself with Laurent Koscielny and Per Mertesacker in the heart of the rearguard. Gabriel Paulista’s time will definitely come. In midfield, Wenger is blessed with a plethora of options and it’s nice seeing him have a headache on the players to use. Francis Coquelin has risen up the food chain to become Arsenal’s primary holding midfielder so he’d return to the starting XI ahead of Mathieu Flamini. I’d expect Aaron Ramsey to continue in the box to box role while the red-hot Santi Cazorla continues strutting his stuff in the advanced midfield role. With Walcott and Mesut Özil still working their way to full fitness, I’d expect Rosicky and the German to support Olivier Giroud on the flanks. With the Gunners losing in such an unconvincing fashion against Dortmund, the players had to give better accounts of themselves in the game against Aston Villa. The manager made five changes from the team that shared the spoils with Manchester City but the Gunners began the game in nervy fashion when Wojciech Szczesny made a poor clearance but he was alert to parry Fabian Delph’s drive at goal. Aaron Ramsey hasn’t been in good form of recent but he compounded his miseries when he lost the ball further up the pitch to Kieran Richardson and the winger fed Gabby Agbonlahor that closed in on goal. With Szczesny in No Man’s Land, Koscielny was on hand to make a vital interception. Ozil swung in a corner kick that was attacked by Calum Chambers. 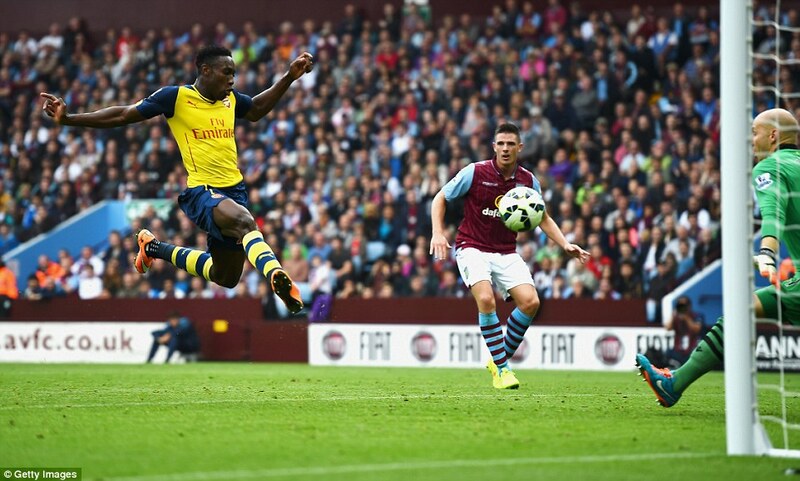 Danny Welbeck showed great improvisation to attempt a scissors kick but his a shot was blocked by the defense. Cazorla dipped in a cross that fell to Ramsey’s path and he didn’t need a second invitation to drill a shot that went wide. Aston Villa almost took the lead when Tom Cleverley swung in a dead ball that was headed at point-blank range by Ciaran Clark but Szczesny stepped up the plate to make a magnificent save. With the home team failing to take the initiative, the Gunners grabbed the lead when Welbeck split the defense with a neat pass to Mesut Ozil that placed the ball past Brad Guzan. You could see the relief in the German’s reaction because he needed that badly. Ozil turned from scorer to provider in typical fashion as he latched on to Cazorla’s pass to feed Welbeck that opened his Arsenal goalscoring account with a blasted effort into an unguarded net. Two goals changed to three almost immediately when Kieran Gibbs fired a tame shot that was deflected into the net by Aly Cissokho. The last time Cissokho played against the Gunners, he was part of that Liverpool team that decimated Arsenal at Anfield last season. It was sweet seeing him suffer the ignominy of an own goal. As expected, Welbeck’s opening goal gave him some measure of confidence and he attempted a neat shot at the edge of the area that was saved by Guzan. Ramsey almost put Aston Villa back in the game when he made an awkward pass that gifted the home side a corner. The resulting corner went to Clark’s path but the Ox made a superb block from Clark’s shot. Chambers showed his inexperience as he grabbed unto a player further up in midfield, probably forgetting that he was walking on a tight rope with the yellow card he had initially received. Luckily for the lad, the ref decided to be lenient with him.‎ Chambers made a neat one-two with the Ox before drilling a cross that was blocked by Phillippe Senderos with Ramsey on the prowl. Arsene Wenger summoned Jack Wilshere, Lukas Podolski and Tomas Rosicky that came on to have a decent run-out with 20 minutes or so to go. The remainder of the game was played in pedestrian fashion as the damage had been done in that three-goal blitz in the first half. 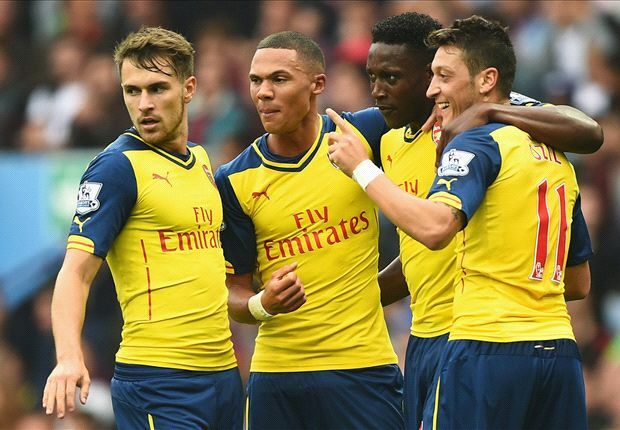 The game itself was a more comfortable affair in sharp contrast to the horror outing the Gunners put up in Germany. Speaking of Germany, it was a wonderful performance from Ozil that has come under some stick with the fans and media alike. Yes, he came to the club with a mammoth price tag and the expectations were massive but this season he has been played ‘out of position’ and with his lethargic style of play coming into mind, he was bound to struggled. However, Jack Wilshere’s knock paved the way for the German to ‎play in his favored No. 10 role and we could see the massive difference it made. If he was walloping in the right wing, I don’t think he would have latched unto Welbeck’s pass to coolly place the ball past Guzan. The manager urged for patience but Ozil repaid Arsene Wenger’s faith in him. The Gunners endured a torrid game against Dortmund in midweek and they had to put up a better performance against an Aston Villa side riding high in the league. Just like last season at Villa Park where the Gunners scored two goals in 66 seconds, it had a deja vu like feeling as the Gunners banged in three goals in three minutes. Gooner Daily rates the performances of the players on the day. Tomas Rosicky, Jack Wilshere and Lukas Podolski came in and had couples of neat touches without having any real impact in Arsenal’s attacking play. 6/10 each. Do you agree with these ratings? Feel free to share yours with your comments.